This week, our diving instructor Joerg and two of our divers had a very special underwater encounter. A truly magical moment! 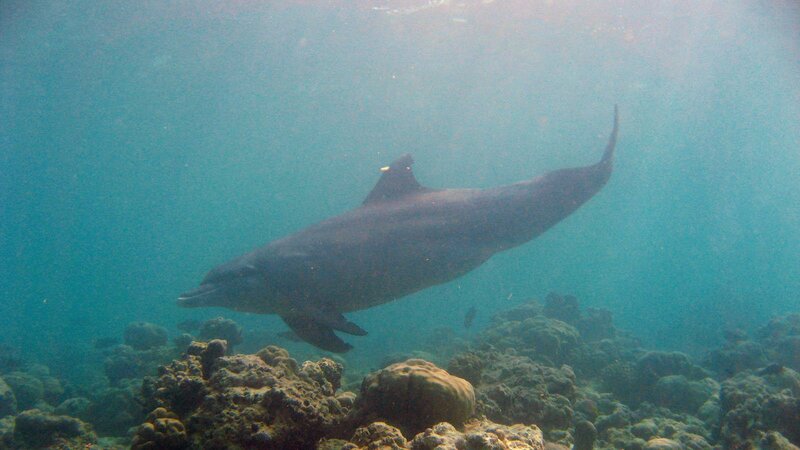 They were at Dhonfanu Wall, midway through their second morning dive when they saw two bottlenose dolphins. At first, they thought it would be one of those lucky but fast encounters, where you just get a glimpse of them. It turned out to be their lucky day! The dolphins stuck around for about 15 min. 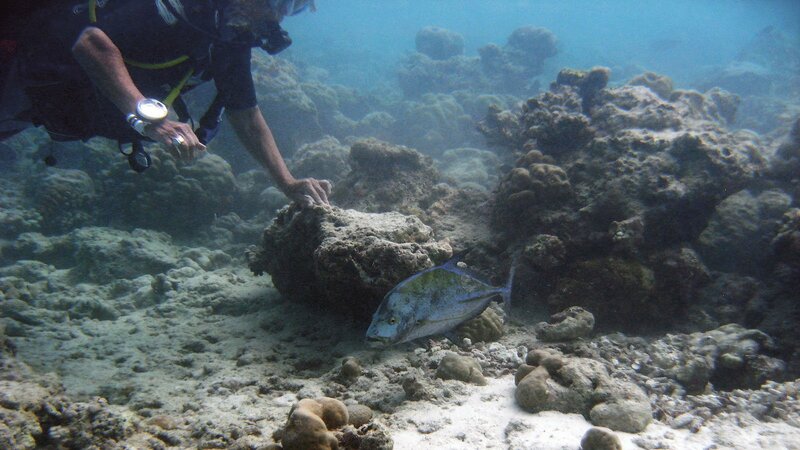 They kept going around a coral block and stirring the sand; visibility got very poor. Once they left, Joerg approached the coral block and found out what it was all about. There was a blue fin jackfish stuck in between the corals. It must have tried to escape the hungry bottlenose dolphins. Believing it was already dead, Joerg pulled it by the tail and surprisingly it slowly swum away. The poor jack was exhausted but still alive. A few minutes later the dolphins came back looking for it, but the jackfish was gone by then. As you can imagine, the divers came back with a big smile on their faces. It was dive number 99 for one of them, and he is already wondering what he will see on his big 100th. They recognize themselves in the mirror, which shows that they are self aware. NEVER leave your camera on the boat! You might think you are going to see only macro stuff and leave your camera (which was set for wide angle) on the boat and guess what? That’s when the magic happens! Joerg still beating himself up for that one! Luckily, our diver had a camera with him to register this amazing encounter. Thank you Didi and Claudia for sharing the video and pictures with us!